Up till today, both you and us had no choices when using a flipchart. There was only the ordinary one, more or less beautiful, but that was the only available. 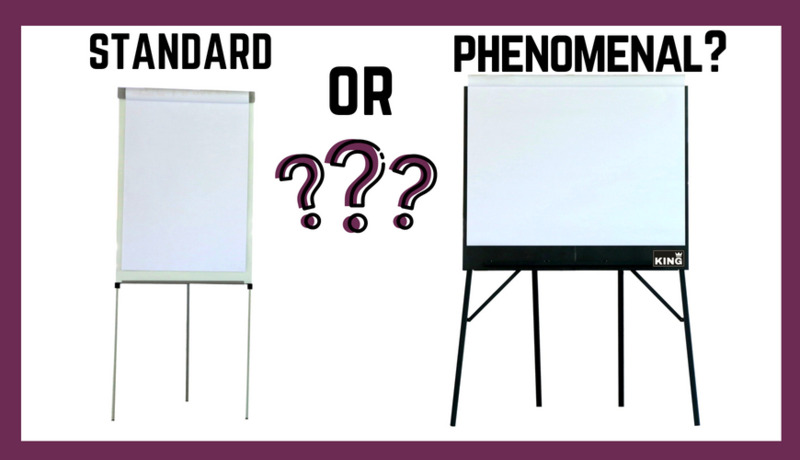 From today on, you now have the possibility to choose: the conventional board or the majestic double-wide KING Flipchart. A picture is worth more than all words! The common flip chart you can purchase and find everywhere measures cm. 70x90: their panel is 80% smaller in comparison to double-wide one of KING Flipchart. The dimensions of KING's panel are cm. 120x100. One KING is worth two conventional easels! It's majestic! It doesn't limit the presence of the coach on the stage. With common flipcharts you find yourself to write sentences that begin straight and they end twisting. What's ugly in this image is that you too usually begin straight and you end lopsided, crooked and refolded on yourself. This is because you've to write your sentence (all on a line, possibly!) and you've not enough space. With KING Flipchart you enhance your message because you have +80% of extra space for writing! In a few seconds you unfold KING and you start using it. In few seconds you refold it and move forward to live other adventures. When refolded, King reduces its volume of so much as 14 times! It is not visible out from the first rows in front of the stage. KING's is huge and it allows all the audience to comfortably read what you're writing. It is not heavy: all easels weigh a lot, over 20 kg and they are not comfortable to be handled. KING is very light, it's less than 15 kg. When folded you pack it in its case and you easily move around. It is not ugly and anonymous. KING Flipchart is beautiful,a piece of design, in powder painted aluminum in an elegant grey anthracite color. With KING you're remarkable! I want you to give a look at the video showing how to fold/unfold the huge KING: you'll see the accuracy of the components! KING Flipchart is prestigious and made in Italy. We are the only ones producing it all over the world!